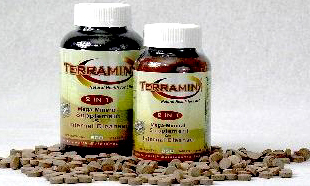 TERRAMIN® is the best-selling ION-MIN® Brand. It comes in three forms: Powder, Tablets and Caplets. This is the edible minerals product which is the flagship of the entire ION-MIN® branded product line-up. 1 lb. jar - 2 lb. pouch - 4 lbs. pouch - 8 lbs. pouch and in Bulk boxes/bags. 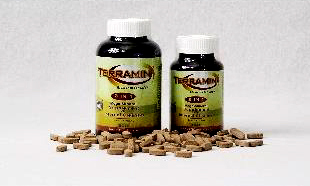 Tablets are available in 1 gram form in either 250 or 500 count jars. Caplets are available in 1.5 grams form in either 150 or 300 count jars. 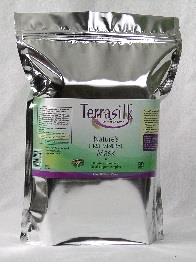 Terrasilk™ powder has the finest particle size of all ION-MIN® labels. It is used as a natural tooth powder, for a luxurious effective facial clay skin mask and to help alleviate the ravages of skin conditions such as acne, eczema, psoriasis and sunburns. 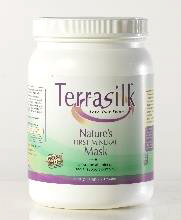 Terrasilk™ powder is available in an 8 oz. jar – 2 lbs. jar – 4 lbs. jar – 8 lbs. pouch and in Bulk boxes/bags. 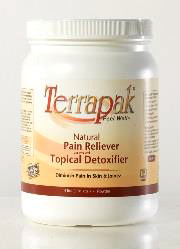 Terrapak® is a soothing healing agent and is wonderful for a natural pain relief product. Free from chemicals whose side effects can be more problematic than the cause of the pain. Used as a poultice for cuts, abrasions, sprains, joint pain and as a body wrap. It is used topically and can be applied directly to the skin to mitigate the pain of insect bites, cuts and scratches. 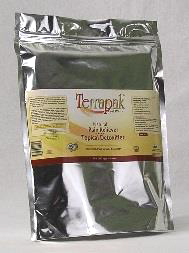 It is a natural anti-bacterial agent and acts to remove toxins and pathogens. Terrapak® is available in a 4 lbs jar. - an 8 lbs . pouch and in Bulk boxes/bags. Terrapond™ is used to clarify and polish water. It does so by removing harmful toxins, bacteria, organics, and other items that make water unhealthy. 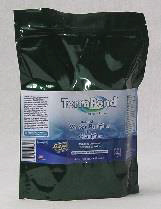 Many fish owners use it in waterways and aquariums because it feeds the fish helpful minerals and fertilizes the water plants, as well. 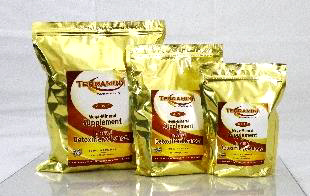 Terrapond™ is available in 2 lbs. – 4 lbs. – 8 lbs. pouches and Bulk boxes/bags. 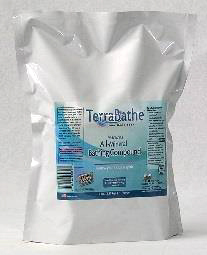 Terrabathe™ provides many of the same benefits as Terrasilk™, but is used for bathing for the entire body. It removes toxins with its powerful negative ionic charge and leaves your skin healthy and supple. The nutrients in TerraBathe™ are important for smooth, supple and youthful healthy skin. Terrabathe™ is available in a 5 lbs. pouch and in Bulk boxes/bags. 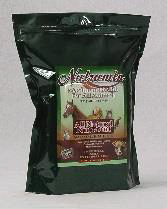 Studies show that animals benefit equally as well as humans when ingesting nutritional edible minerals. 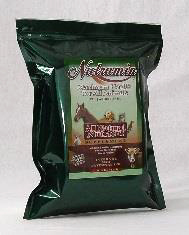 The Nutramin® Universal include benefits for: dogs, cats, birds, fish, rabbits, hamsters, pigs, horses, cattle and all other animals. After all, every animal on this planet needs Minerals and the nutrition they bring. Research has shown awesome health and growth in young animals when given Nutramin®. Benefits include stronger teeth, bones and joints, better digestive health system and increased longevity. 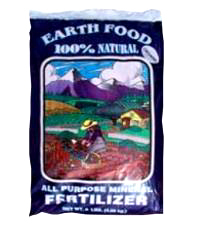 Earthfood™ plus contains a 12% mix of organic dried blood meal as a nitrogen source to promote the growth of plants. Exotic and fragrant plants such as orchids, lavender and roses thrive with small amounts mixed in the water container and watered as usual. In many parts of the world where hydroponic growing operations are in place, clay minerals are used as a primary source of micro/macro and trace minerals nutrients. This product has limited availability. It will be sold until the current inventory is exhausted and no more will be produced. 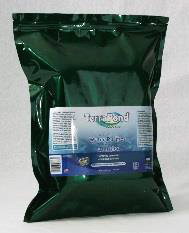 Earthfood™ plus is available at discounted prices and can be purchased in a 9 lbs. bag and BULK in boxes/bags. 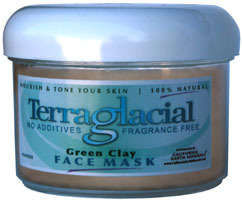 Terraglacial™ is the first Premium Montmorillonite clay that is not from the mine site in the Colorado River Delta. It is a clay created by Glacier movement and has many of the same important properties of a montmorillonite clay, being in the Smectite group, but it is different in the way it works. Its purpose is a cosmetic clay, ideal for face masks and overall skin conditioning. 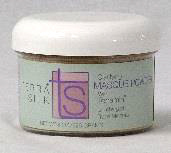 It is a cooling, soothing clay and is a great alternative to the desert clay, Terrasilk. This clay is also available on a limited basis, but more will be produced if our client's responses show that it is a clay suited to be marketed under the ION-MIN® Brand Umbrella. 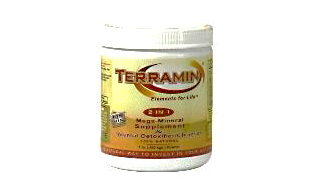 Terraglacial is available in an 8 oz. jar.